If these all make perfect sense to you, you might be a personal finance nerd. At one point in high school, I was the captain of both the Math Club and the AV Club. I did school plays, enjoyed a game of Magic: The Gathering from time to time, spent many days building computers and many nights at "LAN parties" playing StarCraft with my friends. It's safe to say I was am a "nerd." Today, however, I'm a different kind of nerd. I'm a personal finance nerd. In other words, I enjoy talking about money and what it can do. I find the entire concept of money fascinating and love to find ways to make it, spend it, invest it, hide it (legally! ), multiply it and share it. A couple weeks ago I went to the Financial Bloggers Conference (FinCon14) in New Orleans and had an amazing time hanging out with hundreds of other "personal finance nerds" just like me. Sure, most of them were not real estate nerds (we are a "special" kind of personal finance nerd), but they loved talking about money and business all the same. During the conference, one specific thing stood out to me: personal finance nerds are different. We think a little differently than the rest of the population -- for good and for bad. So today I thought I would outline some of the ways we stand out. OK, let's get to it. 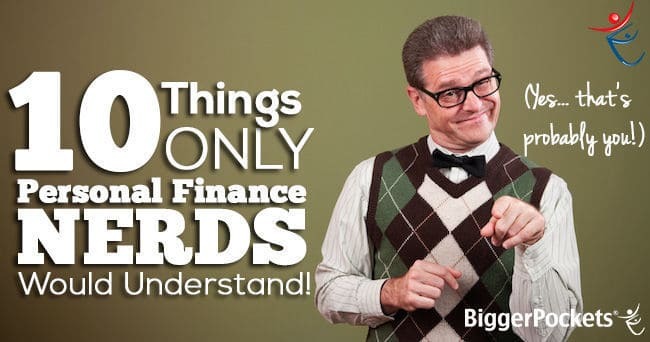 Below, I give you 10 things only personal finance nerds would understand. Personal finance nerds understand the need for sacrifice. While the rest of our friends are busy buying the latest video game system, new shiny car or big house with the four-car garage, personal finance nerds are patiently waiting. We try to live below our means with the hopes (and assumptions) that someday our sacrifice will pay off, and we'll be able to have even more. For those who have read The Millionaire Next Door, you'll understand this. Millionaires are very different from what the general population thinks they are. Most of the world thinks of the world "millionaire" and envision those crazy reality TV housewives. However, personal finance nerds know better. We know that the typical millionaire hides among us, driving normal cars, living in normal houses, and living normal lives. Personal finance nerds are not frugal for frugal's sake (well ... some of them are!) In fact, most personal finance nerds know when to splurge on something nice -- because they can afford it. The difference is timing. Most of the population buys stuff they don't need, that they can't afford, to impress people they don't like. Personal finance nerds save up and plan for the stuff they truly want to enrich their lives. Which would you rather have: $1,000 every day for a month or $0.01 doubled every day for a month? The $1,000 every day for a month would net you $31,000. This is linear growth -- it goes up the same every day. The penny doubled is compound interest, which grows exponentially. Any guess how much you'd have after 31 days? Boom: $10,737,418.20. That's the power of compound interest. So ... which would you rather have now? Like I said, personal finance nerds get this. That's why they invest their money -- to grow it exponentially! Savers grow linear, investors grow exponentially. Look -- high school is great for a lot of things. You can learn how to find the acute angle on a triangle, what the Emperor Nero did to people he didn't like, or how to make a piñata out of paper mache and a balloon. But when it comes to things that actually matter in life, like "how to build your credit," "when is the right time to buy a house," "should you get those store credit cards," and more -- schools fall short. And I think the only ones who see this are personal finance nerds! 5.) Getting out of debt can actually be fun! I know -- if you are not a personal finance nerd, you might think this is crazy. Most of the world probably thinks the process of getting out of debt is a labor. But honestly -- getting out of debt can be fun! For nerds like me it's a puzzle, a game. Each time I pay off a credit card, student loan, whatever, I'm seriously pumped! I like to sit down with a pencil and paper (or spreadsheet) and try to figure out how long until every debt I have (including mortgages) are paid off. It's exciting stuff! Look, I'm sure George Clooney's wedding was awesome. It was plastered all over the news, in every newspaper, in every magazine. But ... honestly ... I'd rather spend my time reading some great personal finance articles to better my position in life. I know ... I'm a nerd. These are all awesome sites, so I highly recommend you head over to each one and subscribe to their email lists! Not only do they all have excellent information, they also feature excellent writers who make reading financial posts fun! Do people get rich quick in life? But personal finance nerds know: there is no guaranteed way to get rich quick. It takes time, patience and sometimes a bit of luck. However, we also understand that building wealth is totally possible, and it doesn't take a genius to do so. Simple actions can make dramatic differences over time. In most of society, people brag about their cars, their houses, their golf clubs, whatever. Only personal finance nerds brag about how cheap they can be. The concept of "travel hacking" also fits into this, as personal finance bloggers love to share how cheap they are able to travel using credit card reward points. 1.) It's not about the money. It's about freedom. Finally, the number one thing that only personal finance nerds will understand is this: it's not about the money, it's about the freedom. Honestly, most of us don't do this because we want our bank account to have millions of dollars in it. The point is not the money -- it's the freedom that money can buy. For me, I couldn't care less about how much money I have in the bank. What I want is to be able to travel when I want, be with my future kids all the time, spend time with my wife away from work and work on stuff I actually enjoy working on. Money can help with those goals, but the money is not the goal. And I think most personal finance nerds understand this. All right, you've come to the end! Now it's your turn: chime in below, and let me know what you think. Do you have any other things you would like to add to the list? Or let me know which number rings most true for you! BiggerPockets.com is the premier real estate investing social network, information hub, and marketplace. With more than 200,000 members, it is the one stop destination for real estate investing education, networking, marketing and deal-making.